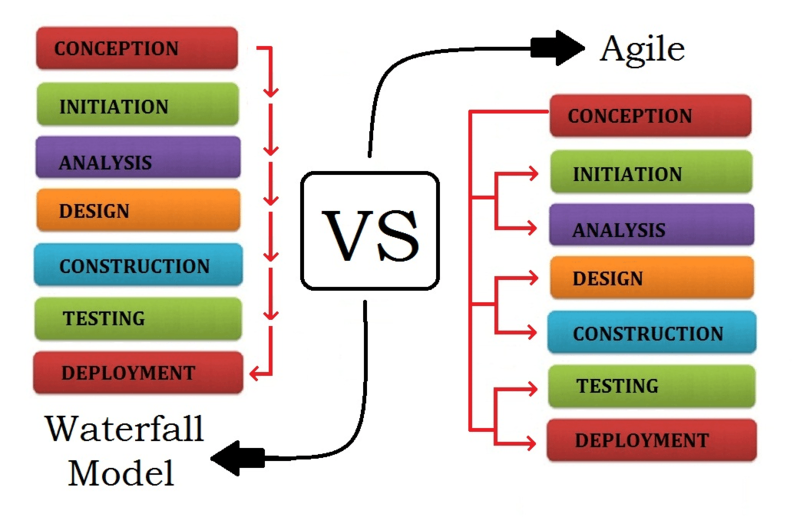 How to manage agile and waterfall methodologies together? Imagine the process of assembling a car, certain steps need to be completed before the car can move onto the next phase. The waterfall methodology is very much the same because it follows a sequential process. Each of the eight steps (conception, initiation, analysis, design, construction, testing, implementation and maintenance) will need to be completed chronologically. Extensive planning needs to be done before the project begins because there is no room for error. The Agile movement was first introduced in 1970 by Dr. Winston Royce who sought out an alternative to the traditional project management approach. Royce didn’t believe that project development should follow an assembly line routine. He thought project management teams could respond better to uncertainty if they first created a project design and then followed incremental work cadences also known as sprints. This allowed each aspect of the project to be reviewed and bugs to be discovered. While the two appear to be polar opposites they can very well co-exist in a single environment. The first thing that needs to be done is make sure all project managers, task performers and stakeholders understand their differences and appreciate what they both have to offer. Trying to find fault or prioritize one or the other is only a set back. Strong and continuous collaboration amongst team members will help to maintain calm even when frustration may arise. Since waterfall methodologies require project planning to be done up front while agile teams prefer doing it progressively, it will be extremely important that synchronization between the two is maintained. Furthermore putting in place a project management office (PMO) will be beneficial. PMOs help maintain governance across all teams and monitor the overall progress of the project, making sure it follows the organization’s vision. There’s nothing better to help you with managing the two methodologies than a good set of project management tools. PMOs in particular enjoy depending on tools that will quickly and easily provide them with project metrics and report upcoming deadlines, tasks that need to be completed, etc. This allows them to evaluate how well the methodologies are working and what may need to be done to improve. Take the time to find an efficient project management solution, such as ITM Platform, which is capable of gathering information from both agile and waterfall projects and merging the two into a single platform. This is very important because it will create a central repository for all the project data which will be used by all team members. The biggest challenge companies face isn’t trying to decide whether they wish to use agile or waterfall methodologies but rather it’s their fear of change that holds them back. Forcing employees to change their ways and adopt a new model of work can be difficult and often disastrous. Luckily, it also isn’t necessary. Once again, adopting a flexible project management solution will allow team members to ease into changes and learn to adapt and work with both methodologies. This will allow you to achieve a successful union between the two, increasing productivity across all projects and the entire organization.